The end of the school year is such an exciting time for kids. For most it means no school for the summer and that is just downright exciting, even for those students who love learning. It is always nice to take a break! The last few days of school, whether you are homeschool or in a traditional classroom, are fun too. They are typically finishing up last minute projects, having parties and creative activities to help remember the year! The last few days are about thinking back on fun memories as well as creating just a few more. If you have spent your whole school year with different themes, having a non-traditional themed week or day may be fun for your kids. The countdown chain is a classic. This colorful chain adds a twist on the classic, adding something fun each day. Another great countdown idea is to use balloons with fun activities inside. If your kids love popping a balloon, these will add fun to each day of your countdown. A great way to get one more social interaction with a classroom is with this end of the year bingo printable. Graduations can start as early as Preschool. This sweet Preschool graduation printable keepsake is perfect for writing down your preschooler’s favorite memories to help you remember for years to come. A printable memory book is a fantastic way for kids and parents to remember the details of a particular school year. A end of the year portfolio is a fantastic way for kids to save their work from the whole year. Included could be science projects, tests, writing assignments, and anything else the child wants to keep. Ice cream parties are always fun. This ice cream party has a take home craft for each child to remember all of the students in their class with a colorful ice cream scoop for each child. 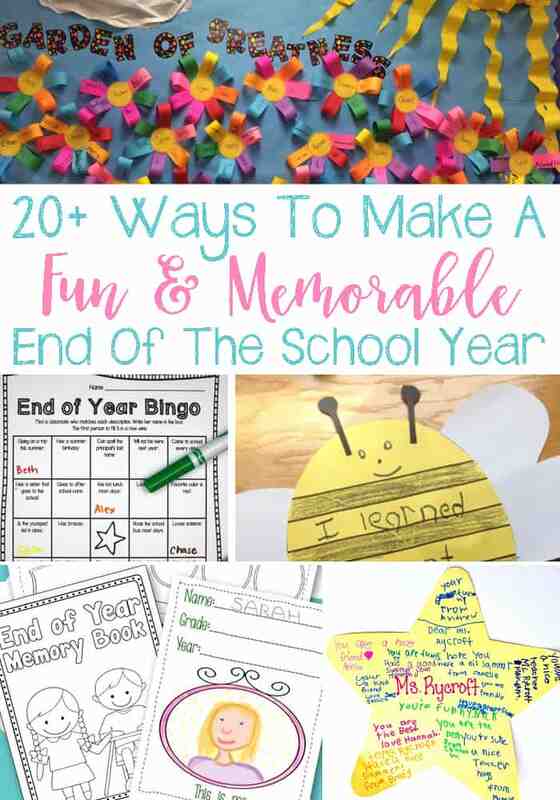 A super cute bumble bee craft turns into an adorable canvas for children to share their favorite memory of the school year. Lemonade is a summer essential for most! These adorable lemonade questionnaires lets kids answer a few questions about summer with an adorable lemonade craft! Saying goodbye to a school year sometimes means saying goodbye to friends and teachers. Goodbye stars are a great way to give special messages to students and teachers from students. Remember what you have learned throughout the school year is not just ABCs and 123s. Kids can brainstorm what they have learned and add to the petals of these sweet, colorful flowers. Help prevent summer slide by offering summer reading charts. Summer Reading Programs can be fun like this one which includes a Reading Bucket List, Reading Bingo, and more! Having a party is a fun way to celebrate completing the end of the year. Add Science to your end of the year party with this Science Lab Ice Cream Party. A beach theme field day party is another end of the year party idea that would be fun! A beach theme can lead to lots of game ideas to play outside! Traditions for the last day of homeschool are fun. These glitter toes is a great idea and a fabulous way to relax, have some colorful fun and play with glitter. Having a literal finish line is a great visual way to show kids that their year is over! And how fun it is to destroy paper like this? Create an art gallery of your kids’ artwork from the full year. This is a fun way to display their art and build their confidence. Graduation caps are an essential for the end of the year for many grades. 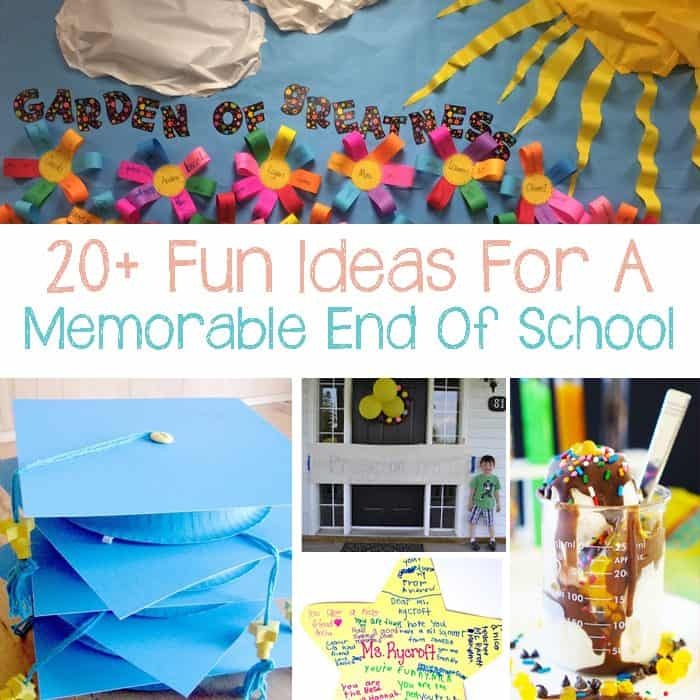 These DIY Graduation Caps would be a fun project for kids to make their own in celebration. With so much to be excited about, the end of the school year is a special time. Kids are reminiscing on what they have learned and done as well as creating a few last minute memories for that school year. Creating extra special memories and spending these exciting moments with your kids or students doesn’t have to be stressful. It can be simple to give a little extra to your kids with these super fun ideas.